Hello songs for circle time are a special bit of magic all their own. Children come into a setting, excited and buzzing about! They’re saying hello to their friends, giving hugs, high fives, and giggling. Dare I say that maybe they are even running around and chasing one another in circles. How do we shift their brains from this frenzy and turn the scene from an excited zoo to focused and calm serenity? You need a transition, and welcome songs are going to do the trick! Good Morning songs and welcome songs work too. But these songs specifically say the word, “hello.” These are my tried and true songs that almost no child can resist. Plus, you can do them any time of day or any setting with a group of children! I’d love to hear any that you know of that aren’t on my list too! 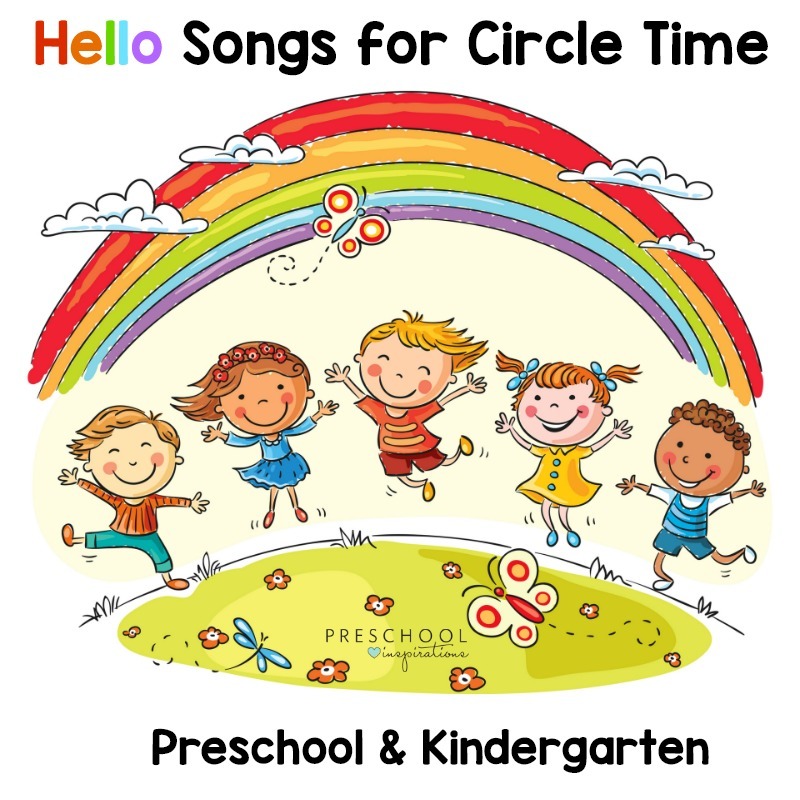 These hello songs are perfect for small groups or circle time! Music can help promote a positive atmosphere for children and this is especially helpful at the beginning of the day with a Hello Song. These can start the day off right, encouraging children to open their minds and be willing to absorb all that the day has for them. If you want to get songs without the ads from YouTube, there are a couple simple solutions. You can click the songs directly from this post, and it should take away most of the ads. Screen it first to make sure it works for your needs. If you are using just audio, I have Amazon Music Unlimited which isn’t free but well worth it for me because we use it each day between the classroom and home. If you would want to download more than 10 songs a month, it’s worth its weight in gold! It’s compatible with your phone, electronic devices, Alexa, and computer. What’s great is that I can download the songs while I’m home on my phone using wifi with the Amazon Music app. Then the songs are always there on my phone, and I can play them in the classroom, the car, or anywhere else. There is also a 2 million song music library with Amazon Prime. That’s how I started, but then I eventually switched to Amazon Music Unlimited because it has nearly every song. Dr. Jean never disappoints, and this song is a perfect way to say hello to children! This can encourage kindness and friendship. It also can help reiterate how to greet people. Plus it is upbeat and fun so kids will respond well to it! If you go to a local story time at your library, this may be one of the songs they use. It is so fun and perfect for any group setting! Children get to practice singing this song at different volumes and work on listening skills — all at the same time! This is a great hello song from the talented Nancy Kopman. This song helps teach listening skills as well as learning parts of your body! Both of these are important skills that preschoolers and other young children need to learn! Super Simple Songs has this catchy and inviting hello song that you can learn in a flash! This is perfect for a quick activity in the morning. This is important for teaching how to be a great friend. This catchy song might be in your head all day long though. Hello, Hello Can You Clap Your Hands? This is another song from Super Simple Songs. This song incorporates actions and stretches which helps clear minds and get wiggles out. Basically this is a great middle of the day song! This Hello Song from Sound Pathways Music is a great one that is silly too. Kids like to be silly, especially when they are doing ‘directed’ silliness. It is extra fun when an adult is being silly with them. This hello song is perfect for bringing the children together to make a circle and get them ready for circle time. This shows how fun working together can be. This song is great to be followed up with a favorite book, felt board story, or anything else you have planned! So there you have it! A little bit of magic inside of a song. The songs help teach, get the wiggles out, encourage friendship and create positive atmospheres. 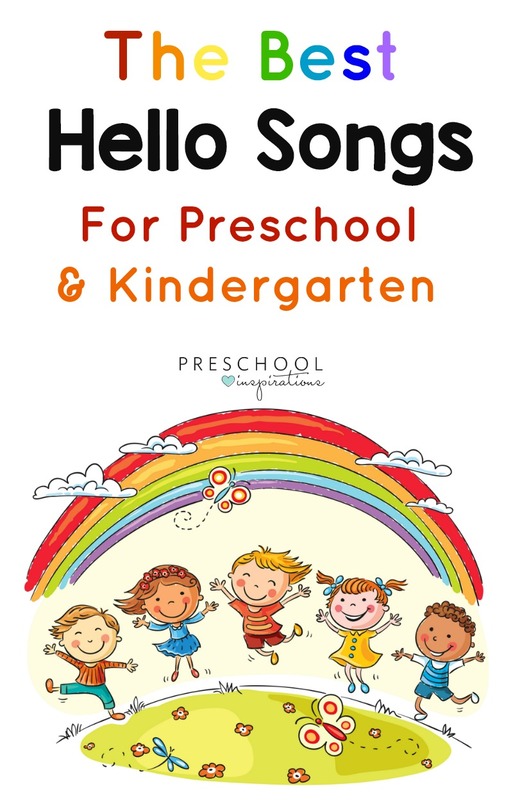 These hello songs work for older toddlers, preschoolers, kindergartners, and more! Awesome collection of songs! Thank you for including my songs, too!